Girly Shower Favors & Chic Wedding Favors! 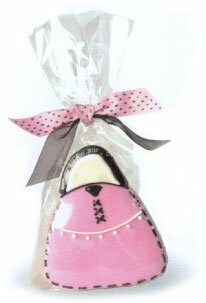 These are great gifts and wedding favors with a chic chick theme. In this section you will find shoes, handbags, purses, and dresses! Everything that a true shopper loves! We have girlfriend favors. 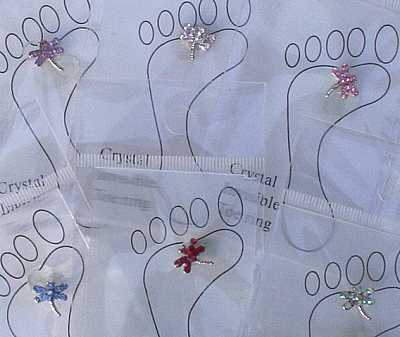 These favors are great for girl's night out or a true diva party. This really cute purse manicure set is a perfect bridesmaid gift or bridal shower gift. Your guests will adore it. 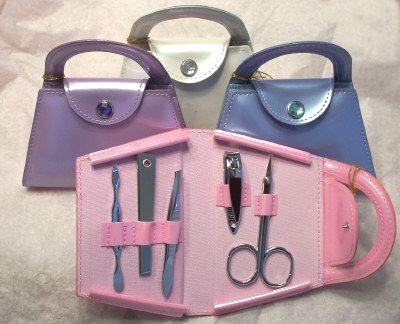 The purse manicure set fits perfectly inside of your purse, so, it travels well. It is made of high quality vinyl. ~5"x5"x1" Price is per purse manicure set. "Matchbook" Tea Party Favors These really cute "matchbook" tea party favors are the perfect bridal shower tea parties and baby shower tea parties. They feature trendy shoe or purse designs. The perfect theme for the perfect young lady. 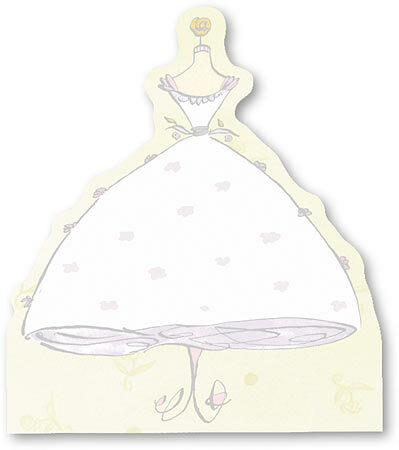 These are also great for gift tags or little girl tea parties. Each "matchbook" is personalized and feature either purse design, shoe design or other cute designs. You can choose either a tea bag, "Love is Brewing" , bag of seeds, "Love is Blooming" or wrapped mints, "Mint to Be". ~2.5" x 2.5" You will be able to select ink color and also the cut-out flower, martini glass, shoe and purse color on the front. The flip flops & shades will be assorted colors. "Love is Blooming", "Love is Brewing" or "Mint to Be" is located on the front. Please enter your personalization information in the comment field below or in the comment section at checkout. 2 lines maximum for the front, and 2 lines maximum for the back. Price is per "matchbook" tea party favor, with a minimum of 12. Please note that the "matchbooks" do not contain matches, only seeds, tea or mints. This versatile Asian Pink Brocade Slipper Favor Box doubles as an uber-chic jewelry box for your sparkly gifts. 5" x 2" x 1" H,Pkg. ct. 6 Great for Asian wedding favors. 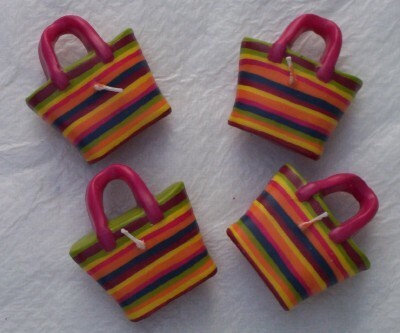 Beach Bag Floating Candles These cute striped beach bag floating candles are perfect for any event. They are just so cute. Put a bow around the box of beach bag floating candles and give them as a gift to a good friend. These make great beach wedding favors or bridal shower favors. The beach bag floating candles are 2.25" x 2". Price is per set of 4 beach bag candles. Bikini Sachets These adorable bikini sachets are 11" L. The bikini sachet is scented with sweet passions scent. Don't forget to add the beach bag sachet! These are great to put into your suitcase for your romantic island honeymoon and a great reminder to put into your lingerie drawer or closet. These bikini sachets make great bridal shower favors. This really great smelling bikini soap is perfect for your guests and for you! 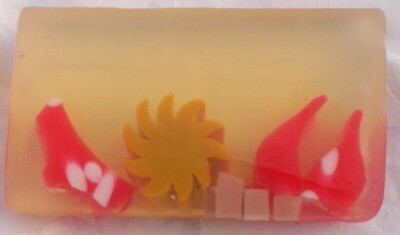 The bikini soap features everything a girl really wants, sun and a red bikini. The bikini soap is made of 100% glycerin. Each bar is 1" thick and weighs ~7.3oz. It has a summer floral scent. The price is per bar of bikini soap. These make great beach wedding favors or summer party gifts. These really cute cafe girls tan mint tins are perfect for your next bridal shower or girl's night out. Each tin is filled with sugar-free peppermints. 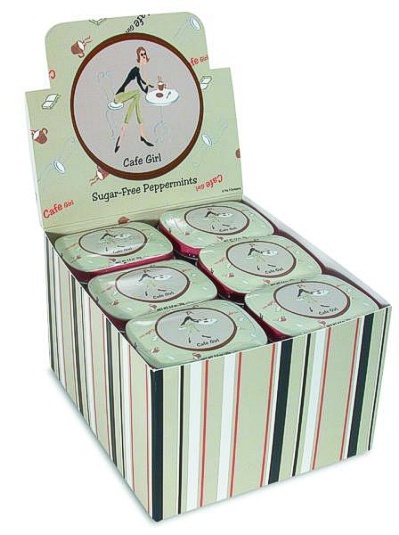 Price is per set of 24 cafe girls mint tins filled with sugar-free peppermints. This candy belly chain is perfect to get the conversation started. This candy belly chain will provide much fun! This candy belly chain is edible. It makes a great gift for the couple, yes couple, or for anyone who wants to have fun. These make great gifts for a friend or for bridesmaids. The candy belly chain is made of candy beads. Price is per candy belly chain. This apple martini gift set is perfect for bridal party gifts or gifts for the couple. The apple martini gift set comes in a green box that includes 1 - 32 oz apple martini cocktail mix and 1 - 3.5oz apple martini rimmer. Price is per apple martini gift set. Non alcoholic. You can purchase the cocktail mixers and rimmers individually and also there are many more flavors to choose from in our . This cosmopolitan gift set is perfect for bridal party gifts or gifts for the couple. The cosmopolitan gift set comes in a red box that includes 1 - 32 oz cosmopolitan cocktail mix and 1 - 3.5oz cosmopolitan rimmer. Price is per cosmopolitan gift set. Non alcoholic. You can purchase the cocktail mixers and rimmers individually and also there are many more flavors to choose from in our . Hip Chicks have fun. You can still have fun and be hip. These appointment cards are fun and hip. These connexxions cards are creative invites. Keep them in your purse and give them to your friends when you want to make an appointment for an adult playdate. 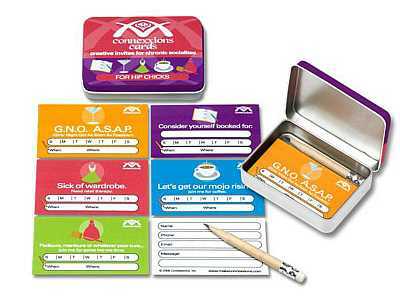 The set includes 25 colorful appointment cards, an assortment of 5, a flip hinged tin, and a pencil. These make great gifts for girlfriends and also shower gifts and shower favors. Each tin is 3.5" x 2.5". Price is per tin of assorted connexxions cards. Party girls always have fun. You can still have fun and be hip. These appointment cards are fun and hip. These connexxions cards are creative invites. Keep them in your purse and give them to your friends when you want to make an appointment for an adult playdate. 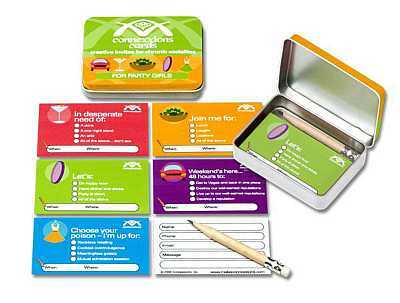 The set includes 25 colorful appointment cards, an assortment of 5, a flip hinged tin, and a pencil. These make great gifts for girlfriends and also shower gifts and shower favors. Each tin is 3.5" x 2.5". Price is per tin of assorted connexxions cards. Reckless housewives have fun. You can still have fun and be hip. These appointment cards are fun and hip. These connexxions cards are creative invites. Keep them in your purse and give them to your friends when you want to make an appointment for an adult playdate. 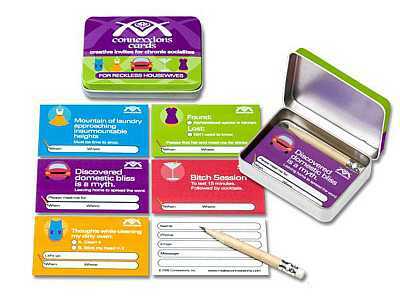 The set includes 25 colorful appointment cards, an assortment of 5, a flip hinged tin, and a pencil. These make great gifts for girlfriends and also shower gifts and shower favors. Each tin is 3.5" x 2.5". Price is per tin of assorted connexxions cards. Corset Sachets Ok, these corset sachets are too cute. Great gifts for yourself or for someone else. They look great in the car, in the office, in the bathroom, in the bedroom, we can go on. They are just too cute! Don't forget the matching purse sachet. 11" including hanger. The corset sachets are scented with a very long lasting sweet passion scent. In stock ships immediately. If out of stock, 2 weeks lead time. Pamper your guest with our personalized lip balm. With a luscious vanilla scent, this soothing lip treatment is the perfect size to drop in your handbag and will soon become a daily part of your beauty routine. Each clear plastic case has a screw-on lid and measures approximately 1.5" in diameter. Personalize with your choice of 17 designs and 4 color options, along with the text of your choosing, and create a favor that is uniquely yours. Please enter personalization below. 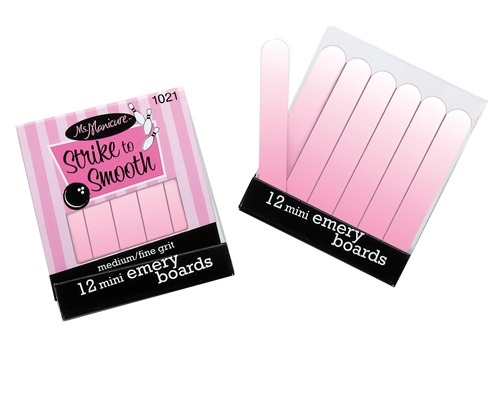 Item is sold in sets of 12, with a minimum order of 2 sets. Personalized Lip Balm Favors arrive separately from the labels, some assembly required (attaching the self-stick labels to the cases). Enter text exactly as you would like label to read. For example, if you want it to say, "Brooke's Bridal Shower", type that in the text box below. Price is per set of 12 personalized lip gloss. 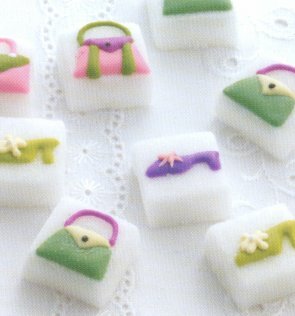 Decorated Sugar Cubes (Box of 18) - Handbags and Shoes These really cute handbag and shoes decorated sugar cubes are sure to be a big hit at your next tea party. Everyone will love this assortment of purses and shoes decorated sugar cubes. They come boxed in an assorted set of 18. 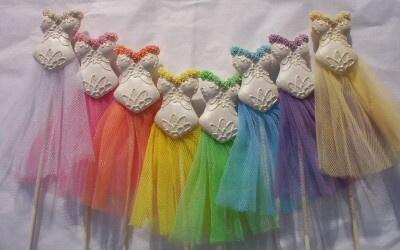 Great for tea parties and party favors. Diamonds are a girls best friend. Why not give your best friend a diamond paperweight. 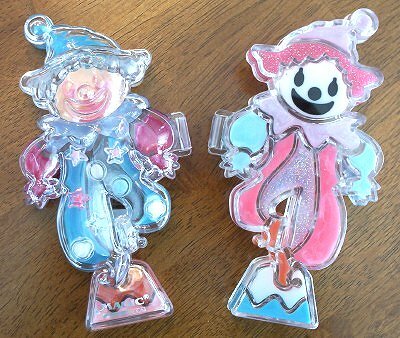 These diamond paperweights are so unique and practical. Each glass paperweight is solid and colored throughout. There are 2 different sizes. The large measures 3 1/4"D x 2 1/4"H, small measures 2 1/4" x 1 7/8". 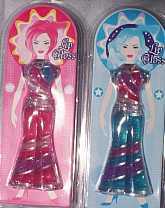 This doll lip gloss is perfect for favors at sweet sixteen parties, slumber parties, or just anytime gifts. The doll lip gloss is a great stocking stuffer. They are truly unique. Assorted colors. Price is per doll lip gloss. These cute dress hankies are perfect for any lady! What lady does not like a cute dress. Each pack contains 10 tissue dress hankies. 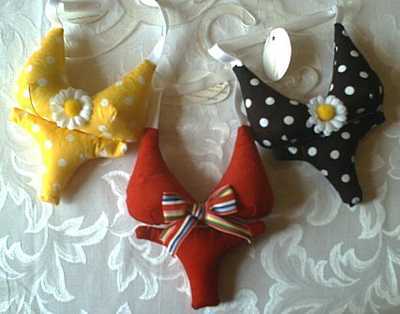 (21.5cm x 21.5cm open) Price is per pack of 10 dress hankies. Dress Lip Gloss Ok. This is one of our favorites. This dress lip gloss is packaged in a cute little dress. There are two sides of sparkle and two sides of frost. The outer is the dress and the inner compartments are in the "under garments". There are 4 assorted designs. Your order will be assorted. These make great party favors and shower favors. Price is per container. This category has a total of 123 products divided in 28 per page.